To help get you excited for a game that doesn’t release until February 2014, Square Enix has announced that the Lightning Returns: Final Fantasy XIII pre-order bonus is Cloud Strife’s Buster Sword, Soldier’s Band, victory move, and finishing animation from Final Fantasy VII. There will also be specific abilities to go along with the outfit and weapon, such as how it helps Lightning reach level 99 faster, but we’ll hear more on that later. This pre-order offer is expected to be available for only a short time, so make sure you pre-order the game as quickly as possible if you want to the free DLC. 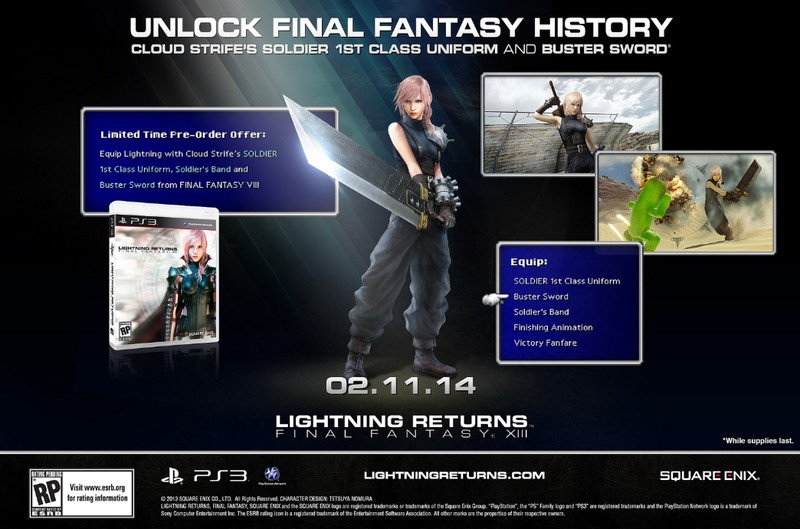 Are you going to pre-order Lightning Returns: Final Fantasy XIII just because of this? Let us know in the comments below.